Nick Massie of PaleoNick.com takes his inspiration for this dish from the molcajete, a stone mortar and pestle commonly used in Mexican cuisine. Massie uses halved acorn squashes for his “mortars,” piling them high with juicy carne asada, shrimp and tomatillo salsa and baking them until they caramelize and bubble. First he toasts the garlic in olive oil, and then he adds the tomatillos, browning them to get some color for the sauce. Next, he cuts the squashes in half and removes the seeds with a spoon. “You can save these seeds if you want to toast them up,” he says. After drizzling the squash halves with oil, he sprinkles them with Cheechako Tako and puts them in the oven until they’re half-cooked. The next step is to add water to the saucepan to finish off the tomatillos—ready when “they’re kind of giving out their seeds and just soft to the touch,” he says. At that point, the tomatillos can be blitzed with a hand blender or food processor. Massie prepares the filling by seasoning the beef with Cheechako Tako and mixing in the shrimp and onions. Finally, he adds the salsa to the meat mixture, pours everything into the “molcajetes” and finishes them off in the oven. 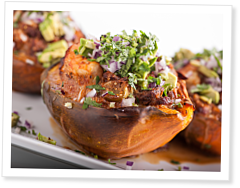 To download the recipe for acorn squash molcajete, click here. Additional reading: “Read ’Em and Eat” by Agnese Smith, published June 24, 2014. Love eggs benedict but eating Paleo? In this Asian-inspired episode of Cooking With Michele Vieux, the CrossFit Invictus coach takes on baby bok choy. The vegetable, Vieux explains, tastes similar to cabbage. For a Zone-friendly way to “fuel your fitness in fine fashion,” try Nick Massie’s latest: Greek freak salad with halibut. Sometimes I'll just binge-watch like 3 or 4 of these episodes and just imagine what it would be like to be talented enough to make a grilled-cheese sandwich without the bread and cheese sliding off.